Chicago-based developer Newcastle Limited has presented plans for two mixed-use State Street developments. Curbed Chicago reports a standing-room-only crowd was “unruly” at the presentation on April 10 hosted by 2nd Ward Alderman Brian Hopkins in the Sofitel grand ballroom. The projects would include 470 rental units and have more than 30,000 sq. ft. of rental space, replacing a Barnes & Noble bookstore and a cluster of vacant commercial buildings. The 11-story project at 1200 N. State St. with 102 rental units “would eliminate a handful of low-rise structures including the former homes of the Tip Top Inn, Hash House a Go Go, and McFadden’s,” Curbed reported. Designer Keith Campbell of CallisonRTKL said the structure would be incorporate a mix of glass, brick, metal and panels. 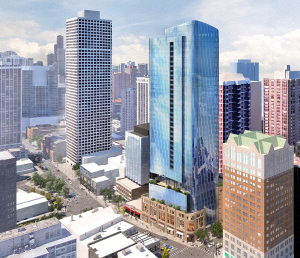 The larger project, at 1130 N. State St., would reach 39 stories, replacing the bookstore at the same address. Architect Solomon Cordwell Buenz (SCB) designed the 368-unit rental structure including 19,000 sq. ft. of retail space. “The design features a more traditional base clad in concrete, stucco, and brick topped by a contemporary glass and metal tower with curved corners,” Curbed reports. Although the buildings would conform to city zoning requirements, their scale requires the Planned Development (PD) process including Plan Commission, Zoning Committee, and City Council approval. If approvals are achieved, construction will start in early 2020.